I was hoping to have a book five cover and title ready to release, but my artist needs another week or two, so you can look for (miracle of miracles) another blog post from me within the next few weeks, revealing all of that. I’m also working on a compilation of the chapter quotes from the first four books. Everyone currently subscribed to my newsletter will receive a complimentary ebook copy once that book is ready for print. Again, I was hoping to have this release ready for you by Christmas, but my cover artist apparently has other clients (imagine!) and I got it to her too late to get it fully finalized before the holiday. So sorry, everyone! However, you can take a look at the two cover designs she’s working on right now. Let me know if you prefer one over the other. I would love to know your thoughts. In terms of book five, we are down to the very last story thread. This is real, people. I’m actually almost done writing the book. If you’ve been reading my blog for a while, you’ll know that means that the book is practically ready to go to print. I can’t work this way. The Muse turns her back on me in utter disgust, and everything freezes up like a deer in the headlights. So I don’t do “rewrites.” I have to write every chapter to—I hesitate to say perfection; let’s say, “capable of achieving an emotional impact.” With that caveat, I don’t leave a chapter until it’s basically as perfect as possible at that point in the story. Once all of the chapters are finished, I have sequencing to do. Anyway, sequencing usually takes most of a day. Then I do a final edit, which involves my own sweep through the story one last time to make sure all of the sequencing makes sense, the story flows well, and nothing jars you, dear reader, as you go from character to character with each new chapter. This usually takes a week or so. After my final edit, the book goes to my core group of beta readers. They read the story at lightning speed, forswearing everything but coffee or tea and possibly a meal once a day, if someone brings it to them. I get their feedback and incorporate any changes I deem necessary. Next, the book goes to my editors. They do a thorough review to ensure the book is free of homonym mishaps and dangerous gaps of continuity and logic resulting from my own nebulous daily subsistence on tea, yogurt and apples. Finally, my copy editor does her final sweep, seeking the dreaded typo, and upon her completion, the manuscript gets sent over for formatting. Basically, it’s all downhill from there, folks. So what’s left to write? Sebastian’s thread. My glorious, back-breaking, stab-me-in-the-heart Prince Sebastian, who’s been as reticent to let me write his story as he is to assume his status as heir to the Eagle Throne. Tied into Sebastian’s thread is King Gydryn, the Duke of Morwyk, Queen Errodan in Calgaryn (yes we will FINALLY get back to her), and a couple of other characters who are the actual viewpoint characters of this story arc (along with Sebastian), but whose names I won’t mention because, spoilers! So…we’re looking at about eight chapters still to write, based on my intuitive sense of things. Sometimes I jump into a character’s head and things really take off. Sometimes I get into the final edit and realize another chapter is needed to fill in a gap. So I’m not committing to the actual number of chapters, but I’m guessing it’s somewhere in this range. Your million dollar question, of course, is when can I read it??? We’re setting a tentative release date of June 15, 2019. (We means the characters and me, in case that was confusing). THE DAY is going to be here a lot sooner than you think, people. For me, knowing everything I have to do before I release this book, June 15th feels like freaking tomorrow. But it’s out there now, and I intend to make it happen. Hopefully at least knowing when you’ll be able to get the book in hand will help mollify the craving. If not, I encourage you to engage in a little holiday frivolity to lessen the blow. And with that, I bid you happy holidays! Thank you for taking time out of your schedule with friends and family to read my update. I hope you all have a fantastic new year. I am so excited for this! June 13th is my birthday, so this will make an excellent gift to myself!! You are a fantastic writer Melissa! What a fantastic Christmas present!! I’m going to start rereading the series now so I’ll be ready when the new book comes out!! I like the cover on the right, but I like the title placement of the left cover. Have a very Merry Christmas!! Yay! I’m so glad I will be able to contribute to your birthday celebration! I can wait until June 15, but if you decide to release it sooner it would not hurt my feelings. I would be elated! Wow, this has just made my Christmas! Thank you so much for sharing this news with us, can’t wait for the 15th June now. My preference for the book cover is the one on the right. I hope you and yours have a wonderful Christmas, and a Happy and Prosperous New Year. 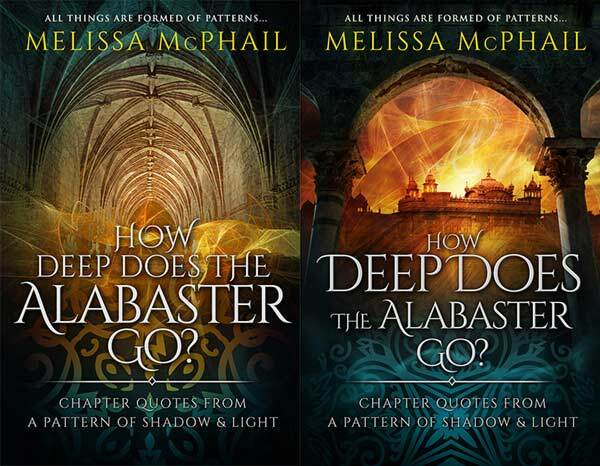 Melissa, to begin with… Yay! We have a date (even if it just a month). I am quite excited. As for book cover, I like the one on the right. I like the city. I love what comes out of your mind. Thank you for sharing you, and the journey of your discovery! I like the right hand cover much better. And I’m SO GLAD to hear the release date is on the horizon! Can’t wait!!! I’m so excited it’s tentatively 6 months away!!! Also I like the cover on the right!!! What a fantastic christmas gift just to get an update. I’m going to start rereading the whole series so I’ll be ready when the new book comes out !! I like the second book cover with the palace in the background, but I like the wording placement of the title on the first cover. Can’t wait to read the first couple of chapters. Have a very merry Christmas !! What a great Christmas gift! Thank you so much! That is great news!!! I can’t wait! Hmm, if June release, means I should start rereading mid April. I definitely prefer the cover on the right. April sounds like a good plan, Stasha. Thank you for your cover vote. Happy holidays! I aim to please, Debbie. Happy holidays! I like your right cover, and I look forward to seeing Tanis again. He is my favorite character, and his mother of course as well. Thank you! Thank you for always taking the time to comment. It’s so appreciated (plus, it’s always nice hearing from you). I can hardly wait for the release. Been a literary pleasure knowing you! Thank you so much, James. I always appreciate your feedback and perspective. Happy holidays! I love the vaulted ceiling cover. That’s my opinion as requested. Thanks for the update on the book. Merry Christmas to you and your family!!! And to you also, Jim! Hi Melissa, exciting news! Can’t wait I’ve loved all your books, your now firmly in my top three authors. Which also means I now have all your books as hardbacks as well as on Kindle. Have a great Christmas and for me without doubt the cover on the right. Thank you so much, Peter. I’m honored to have gained such an important spot on your bookshelf. Noted on your vote for the cover – thank you for that. Happy holidays! Thanks Melissa I can’t wait. Thank you so much, Michael. Happy holidays! You are creating a legacy to rival and indeed, surpass any of the big world builders, your work is truly incredible and has placed itself firmly on top of my favourite list. To say I’m excited about the next book is an understatement, I’m excited about rereading the previous books in anticipation of June 19! Haha. Will the audio be released the same time as the hardback? Also the cover on the right with the title from the left. Thank you so much, Brian. I’m honored by your kind words about my series. I’ve got your vote on the cover also, thank you. I don’t know yet about the audiobook. It’s a little out of my control. My publisher knows the book’s release date and is definitely working on getting the audiobook done, but it depends a lot on Nick’s availability also. I’ll post to the blog as soon as I have any data about the audiobook. Thank you for listening. Happy holidays! What a great birthday present for me if it does come out in June!!! Cephrael must have a hand in the release date. I shall watch the night sky for his hand as the month approaches. LOL, Max. Yes, I guess I’m walking the path properly right now. Happy holidays! Great news. I’m definitely going to plan in re-reading before then! I’d say for me I prefer the cover on the left. It draws your eyes into the scene as if you are actually stepping into the book itself. Can’t wait til June!! Happy writing. Thank you so much for your feedback, Emma. Happy holidays! You go, Girl! Looking forward to the book’s release. As your attention to detail makes the story (ies) cohesive, I am willing to wait until you are happy with the result. You have done an incomparable job to date. I am excited to hear that 2019 will bring the book. Also, the cover in right appeals. Thank you so much, Pamela. I appreciate your feedback and encouragement. Noted on the cover. Happy holidays! Thanks for the update. Seems like tomorrow for you and another life for us, perspective is a wonderful thing. Thank you so much, Doug. You’re right about that – it’s all about perspective, isn’t it? Happy holidays! Thanks for the update! I like the one of the right because it’s “open” behind the lettering but I also like the detail of the arches on the left and the image of being led in. I prefer the lettering on the left cover. Looking forward to June and catching up with the characters. I see the same points in the covers, Micheline. Hope you’re having a fantastic holiday. Happy New Year! Merry Christmas, Melissa! Thanks for the update! LOVE your books and can hardly wait until this one is released!!! I like both covers but prefer the one on the left. Happy Holidays to you and your family! Thank you so much, Terilee. Have a very happy new year! Awesomeness! Cant wait but take all the time you need to get it “perfect” as you say. We have waited patiently so far and i want the best product you can give us. The story deserves it. Merry Christmas to you and your family, enjoy the holidays! I will never give you less than as perfect as I can make it, Sean. You have my word on that. Thanks for the encouragement and support. Have a fantastic new year! Thank you for the update. As for me right cover, left wording. Can’t wait for next shot! Duly noted, Danny. Thank you for the vote. Have a happy new year! Can’t wait! I like the cover on the left. That is fantastic news and so close to my BD that I now know what I will get. *grin* – thanks for hours and hours of engagement and entertainment. You are awesome. My pleasure, Trish. I’m honored that you want to spend so much time in my world. It’s the greatest gift to a writer. Happy new year! Looking forward to it!! My vote is for the cover on the right. Fantastic news. Can’t wait to catchup on the journey of some of my favorite characters, especially Tanis. I initially liked the right cover, but think the one on the left fits the title better. Hope you have a wonderful and productive 2019! I agree with you on the covers, Susan. I think we’ll end up with a combo of the two somehow. I hope you have a very happy new year! Thanks for the updates… right cover has depth. Thrilled to hear Book 5 is almost here! As far as the covers, I like the one on the right, but the one on the left catches one’s attention. It is different and implies depth in a way the right one does not. May your holidays be filled with as much joy as you have brought to us, your adoring fans! Thank you so much, Robin. I agree with you on the covers. It’s going to be interesting trying to figure this one out. Thank you for sharing your vote, and thank you for reading. Happy new year! Great news and congratulations! I am very excited for June! Also tha ka for the heads up on the news letter I have signed up. Based on the title I would go with the left cover as it has a feeling of depth. The tunnel makes me want to peer down and ask myself how deep does it go? Plus the white is a feeling of Alabaster. I agree the cover on the left fits better with the title, Victor. Thanks for sharing your vote. Have a very happy new year! Thank you!!! I vote for cover that appears on the right. Perfect, Mark, thank you. Have a happy new year! I like the covers on the right. Great news about the tentative release date! I had never done a reread of a book, let alone series, until deciding to tackle Malazan again this month. Looks like I’ll be doing my second ever re-listen for your books come the summer. Looking forward to it! Is this the penultimate book in the series? Thank you Melissa. Your stories are the best. I like the cover on the right. Oh thank God. But I love these books and this level of masterpiece takes the time it needs. Hope it gets picked up for movies. Oops. Forgot to say that the left art is better. The symmetrical design of the fractal pattern and adherence to the conventions of typography are better suited to the left I think. Thanks for your vote, Andre. Great news! Thanks for updating us so regularly! Looking forward to Book 5! Sorry if you’ve answered this elsewhere and I missed it, but is Book 5 going to be the conclusion to the series or should we expect a sixth? I like the image on the right but the title typography on the left. The right’s lettering feels too many different font sizes. I look forward to your blog updates almost as much as your books. I wont reread the series until I have the new one in my possession, as is my preference when reading epics. yes I have read WOT atleast 14 times. 15 if you count this past summer waiting for my new favorite author to release her new book. thank you for sharing your vision, and I like the cover on the left as its paterning follows the theme of the series. Awesome stuff! super excited about this. Looking at my calendar, is it June already? Thanks so much for the great feedback, Chris. Really appreciated. I’m thrilled you’re enjoying my series. Thank you for reading. Thrilled to see this update (a wonderful Yule present)!! I’m a little late noticing it (I intensionally hold myself back from checking for updates, else I’d do nothing else!) Cannot wait to read your next book … and not at all surprised to hear that Sebastian is the last one to speak up. In case you’re still open to opinions on the covers … I love them both (for different reasons). The cover on the left is a bit more abstract (appealing to the artist in me), but the one on the right gives a better visual … at least for me. You have really made my day!! I’ll be smiling all weekend long, and will be looking forward to the summer and your next book. Maybe it’ll be on Audible by the Solstice….. Thank you so much for this wonderful story – – and all the work you put into something that brings your fans such pleasure. Thank you so much for your feedback on the cover options, Lauri. You’re spot on for the release of the Sixth Strand on audible – it should be some time in December of this year. Thank you for listening (again and again)! Just finished my 7th re-read of Kingdom Blades. AHHHH!!!!! My favorite series of all time. So looking forward to your feedback on book five in June! This is an incredibly relieving blog to view as i’m sure it’s a relief for you to finally be close to the finish line! I admit i haven’t kept up on blogs. They’re not really my thing but I’ve been running out of things to read and your books have had me hooked! I’m currently rereading (listening as I drive truck) this series for about the 4th time. Only Robert Jordans wheel of time series has had me so intrigued as to listen and read the books so often in only a few years time. I can’t wait to see where the characters paths lead in book 5, and I doubt i’m the only one with the sentiment of not stopping there! Not dragging this series out but continuing to write others stories. You have a gift I could only dream of having! Set your imagination free and tell your stories! Thank you so much for your kind words of encouragement, Keaton. Yes, book five is now finished and off to my editor and I’m heading into planning book six. I’m thrilled that you’re enjoying my series and honored to know you hold my series in equal esteem as Jordan’s Wheel of Time. Thank you for listening. I thought five was to be the finale. I guess that’s good and bad… good that there’ll be another novel, bad (relatively) that closure may still be a few years away. I have been eagerly anticipating book 5. I’ve read through the series five times now. Easily, my favorite series to date! In my opinion, it beats out Jordan’s Wheel of Time and Goodkind’s Sword of Truth(my next favorite saga). I am thrilled to finally have a release date for the next book! There are so many threads to keep up with and I am glad you’re keeping at it. My goodness, Wayne. Five times! I’m honored by your devotion to my series and touched to know mine is one of your favorites. I look forward to hearing your thoughts on book five in June. Thank you for reading (again and again). I just want to say thank you. Thank you for crafting such a well thought out, intriguing and complex series. I just discovered these books not long ago and I have devoured them – to the detriment of my sleep schedule, socializing and eating some days. I’m thrilled that I’m finishing Book 4 just in time for Book 5 to come out. Keep up the good work and continue to excel in your craft.